A 35 year radio vet, Chaz has been there done that as far as different radio formats. Right out of high school he sunk my teeth into college radio and quickly moved on to the legendary KZEW working in research, promotions, on air and music programming. 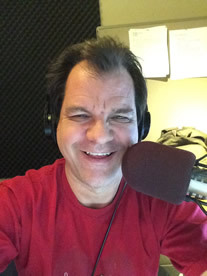 Then moved on to classic rock, smooth jazz and unforgettable favorites and then a long stint doing network radio where he could be heard in all four corners of the states and even overseas in the Middle East among other places! Chaz has 2 boys in their 20’s and likes to play that 12 string guitar, watch Showtime TV and movies and get outdoors as often as possible. Sports is a big player on the big screen at home too!